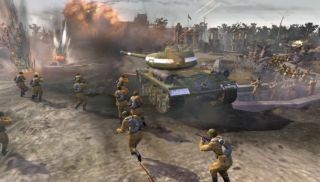 "Look folks," the latest Company of Heroes 2 trailer may well be saying, "we really love tanks." "Sure," it continues, "our game does have units that aren't tanks, but they're just there to make it even more special when you do finally see a tank." Basically, if you're a huge fan of planes, there are really only a few seconds here designed to appeal to you. If you do enjoy the sight of massive, armoured, gun-mounted, metal mammoths, there's plenty here to appreciate. Relic's RTS sequel is promising new and more varied tank on tank action come the game's release on June 25th. And yes, I'm sure there will be other vehicle types too. For more on CoH2, check out our impressions from the mulitplayer beta.